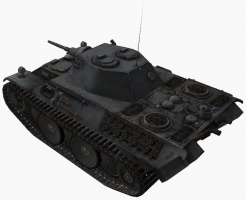 The VK 16.02 Leopard is less maneuverable than the Pz.Kpfw. 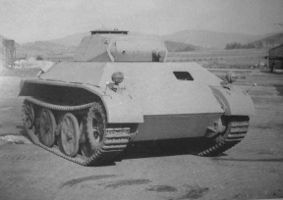 II Luchs, but it has more than twice as much effective armor, a top turret that works well for circling and a much longer signal range. 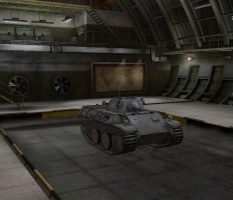 Due to the unusually thick frontal armour and heavy weight, the Leopard can bounce a surprising number of shots and can also be used to ram other tanks and especially arty if there's not enough time to shoot them apart. 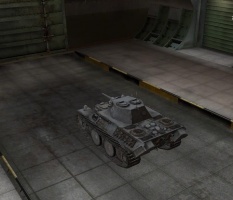 Due to the small turret size, it has better gun depression on the sides than the front and rear, meaning you should position the tank at an angle when on slopes. 5cm KwK 39 L/60L has decent RoF and good penetration on AP ammo. Its top speed of 60 km/h is easily achieved with the upgraded 550hp engine, making it an impossible target to hit for players who auto-aim, and a harder target for more experienced players too. With its 700m upgraded radio range, it ensures that targets will be relayed to artillery and teammates. When fighting on slopes, it is recommended to position your hull at an angle as you have better gun depression on the sides than the front and rear. 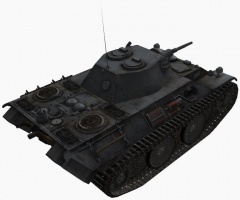 The Leopard has two viable weapon choices: the signature 3cm autocannon also found on the luchs, but with bigger clip and a 50mm single shot gun. The 3cm's 360 damage burst is best applied from close range to the sides of enemies. 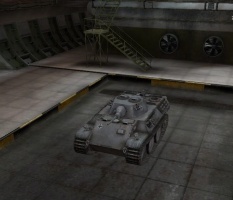 It has surprisingly high penetration, allowing it to penetrate the sides of most enemy Tier 7 tanks with ease. The gun can be used on medium ranges as well, but it is better to shoot in smaller bursts and let the gun aim a bit in between, instead of just emptying the whole clip at once. The 50mm is the more balanced option. Where the 3cm is a close quarters weapon the 50 mm can be used on all ranges. But once again, especially in long range combat sides of enemies are preferred. It has good DPM, accuracy and workable penetration. Circling lone enemies is viable with this gun. 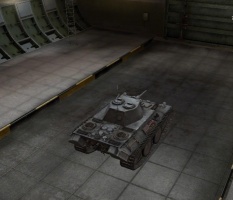 The leopard is much harder to kill with lower tier tanks than the other scouts. 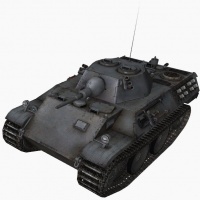 It offers a great amount of armor and a large HP pool, but the armor is irrelevant against most high-penetration, large-caliber cannons at its matchmaking tier. Due to its weight, speed and frontal armor, ramming lighter enemies is a viable strategy in 1v1 engagements, much like in the later VK 28.01. Especially against same tier light tanks ramming can give a nice advantage. It is good to keep ramming in mind as an option when you are on the 3cm's 16 second reload. The Leopard is not the most manouverable tank, but it can definitely give other tier 5 lights a run for their money in a 1v1 fight. 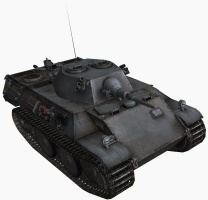 It is the best anti scout in tier with its HP, weight and armour advantage. The 3cm autocannon can finish off any other tier 5 light with one clip. 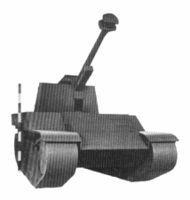 The Leopard can not equip a rammer, which actually makes the decisions for equipment easier than on the other light tanks. You are not as torn between going for damage or viewrange. The FuG 7 radio carry over from the Pz.Kpfw. II Luchs. Mount it immediately for a better signal range. If you already have the top radio from another line, mount it instead. Get the Maybach HL 157 P A for a needed speed boost. Now you have a choice. You may research the upgraded suspension for extra mobility, or revert to stock FuG 5 radio for mounting the heavier 5 cm Kw.K. 39 L/60L if you prefer an orthodox gun. In this case, there will be no weight capacity remaining for equipments. 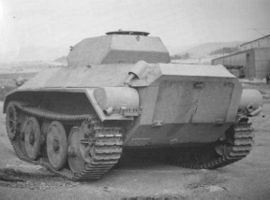 *Despite the Leopard's in-game historical description, a prototype was never built. A prototype was meant to be built by September 1, 1942 but the construction was delayed until the project was cancelled on May 8th, 1944. 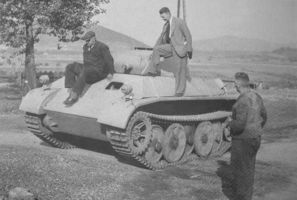 The 2 cm Flak 38 was planned for the Leopard, but only for a Flakpanzer variant. This page was last modified on 18 July 2018, at 05:47. This page has been accessed 503,725 times.